Students and faculty at America’s colleges and universities stand at the confluence of many of the most troubled waters springing from the Trump administration and its corporate-driven, deeply divisive agenda. It’s on these campuses that millions of young adults wonder whether they’ll still have health insurance if Obamacare is repealed. It’s here where those whose parents are undocumented immigrants may be forced to seek sanctuary. Hate incidents have spiked. The arts, science and intellectual freedom are under attack. Countless professors were ensnared by the administration’s ill-conceived travel ban. This deluge is flooding a higher education system in which so many were already barely keeping their heads above water. Families can’t afford to send their kids to college, student debt has skyrocketed and faculty in precarious jobs are earning so little, many must rely on public assistance to make ends meet. Maybe it’s not surprising, then, that college campuses are emerging as centers of resistance in these first weeks of Donald Trump’s presidency. Today, nationwide, at dozens of colleges and universities from Boston to Seattle, students, contingent and adjunct faculty, their fellow working people and allies are standing up, teaching in, speaking out and reclaiming higher education for the public good. A national day of action is raising the banner of #CampusResistance. At the University of Chicago, we are standing up for part-time faculty who struggle to pay for healthcare and are in danger of their losing insurance. Elsewhere across the country there are marches, rallies and teach-ins. The energy surrounding the campus resistance movement is real and growing. As a contingent professor of Hindi and the executive vice president of a labor union, the two of us have different vantage points as we observe what’s happening in our nation and on our campuses. However, we see the same forces at work. New Secretary of Education Betsy DeVos is unqualified and wrong for the job, which she has clearly demonstrated through her attacks on unionized workers and support for commoditized, corporatized higher education. But college campuses are inherently optimistic places. That’s why we can see past Donald Trump and Betsy DeVos. It’s why contingent faculty endure the challenges of the profession. It’s why graduate workers keep at it even when they are underpaid and overworked. It’s why students who wonder what kind of world they’ll graduate into are hitting the books harder than ever. You can’t keep people down who are thinking about the future—their own and that of our country. It’s why students and faculty who joined or applauded as millions of women marched the day after Trump’s inauguration have turned their attention to what they can do right where they are. What they can do—what they will do on today—is more than protest Trump, although it’s essential that we resist and oppose his agenda. Faculty and students will rise up to and stress how important a strong higher education system is to the well-being of the nation. Americans deserve—and need—colleges that are gateways to a lifetime of opportunity for students. Institutions that are once again cornerstones of local and regional economies, providing good, stable jobs that can sustain a family. Places where children of immigrant families can pursue the American Dream without worrying they will be dragged away. Homes to robust intellectual inquiry that advances science and nurtures the arts, uncompromised by the pressures of partisan politics. This is why we and thousands of others are a part of the #CampusResistance — today and beyond. This article was originally printed on SEIU.org in March 2017 . Reprinted with permission. 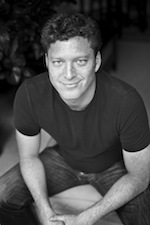 Jason Grunebaum has been a contingent professor of Hindi at University of Chicago for 12 years. 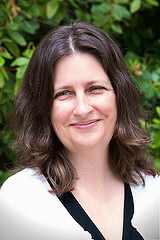 Heather Conroy is an international executive vice president at the Service Employees International Union (SEIU). 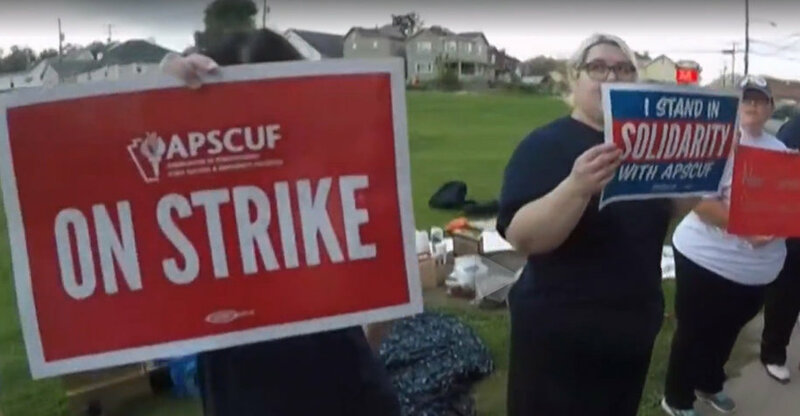 After going without a contract for more than a year, and with their administration withdrawing from negotiation, faculty at Pennsylvania state colleges and universities (but not including Pennsylvania State University, confusingly enough) went on strike Wednesday. The administration is running the usual “oh, those greedy workers” playbook because the faculty don’t want to make concessions on healthcare expenses that other workers have been pressured into. Union President Ken Mash stood outside the chancellor’s office building Thursday afternoon in Harrisburg to push for a resumption of contract talks. State funding for the system, at $444 million this year, is about the same as it was 17 years ago, even as full-time enrollment has risen more than 10 percent. The union also balks at having to take on other duties without compensation, including a 67 percent increase in the supervision of interns who go into the business world. The increase would raise the annual allotment of interns to 120. The union also balks at cuts to competitive grants for research and professional development. Another issue is the state system’s plan to put part-time adjunct professors on a lower pay scale for the first time. And it objects to changes in the promotion, tenure and grievance rules. This article originally appeared at DailyKOS.com on October 22, 2016. Reprinted with permission.